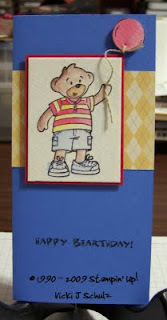 'N2 Stampin' with Vicki: Beary Best Bearthday! Ok, I just have to tell you that when I first looked at the new Holiday Mini catalog, my thought was oh boy I'm in trouble!! So, I do the next best thing and try to talk myself out of needing to order everything! Usually I don't do a very good job of this (hence the need to mount 38 stamp sets in one sitting)... But this time I tried to rationalize... where do I take my stand, well, with the Build-a-Bear products. I've loved Build-a-Bear since my girls first fell in love with them years ago. Each of my children have gotten one at one time or another. But with Raven going into high school, Sierra going into middle school and Keegan being a boy pretty much obsessed with cars and Star Wars, I was really thinking that I wouldn't use the BAB products that often... you know, that stand... So, I put my pre-order in knowing that I wouldn't receive it until after convention. Now, having been a demonstrator for Stampin' Up! for five years now and having gone to four conventions and two leadership conferences, you'd like to think that I would know better than to try to make a stand like that, much less that I should even put an order in before a Stampin' Up! event... But, alas, such was not the case. As luck would have it, my bracelet pattern was called right after the BAB presentation at convention which means that I was now the proud owner of FREE Stampin' Up! product!!! You've gotta love that any way you slice it!! So of course that resolve of not needing the BAB products flew right out the window the moment that bracelet showed up on screen (actually it was out the window during the presentation, but what's a few minutes in the grand scheme of things!!). I won the Beary Best Friends and Beary Nice Wishes stamp sets and the Pawsitively Prints Designer Series Paper. I have to admit that I was very pleased to win these sets... the projects demonstrated on stage were just too cute for words and now I can play with these bears at home! Love it!!! So here's a card that I made for our group meeting right after convention. I just had to use my new products. I watercolored the little boy bear using the Watercolor Wonder Crayons. I think it's very relaxing to watercolor. Maybe not the best choice for a swap when you have 10 of these to make, but still lots of fun! It's so easy to watercolor on our Watercolor Paper. The colors blend so nicely. I stamped the balloon on watercolor paper as well, watercolored it and then cut it out. For the string I tied our Linen Thread through the bottom of the balloon and glued it to the bear's paw using Tombow Multi-Glue. Now I actually have a birthday card ready for Keegan's next birthday friend. I love being prepared (not that it happens that often).